The Pound had a very volatile session yesterday as the BoE decided to downgrade this year growth's forecast from 1.7% to 1.2%, as a result of the ongoing Brexit uncertainty. Moreover, Bank of England Governor Carney gave a speech, warning that the UK may face the weakest growth since the financial crisis in case of a no-deal Brexit. But, he added, that’s not the most likely scenario and that the market should not prepare for further rate hikes. The reaction was nonetheless a 100 pips bounce in the Sterling. Quiet day ahead on the economic release front, so market participants will most likely spend the day digesting yesterday’s economic updates. 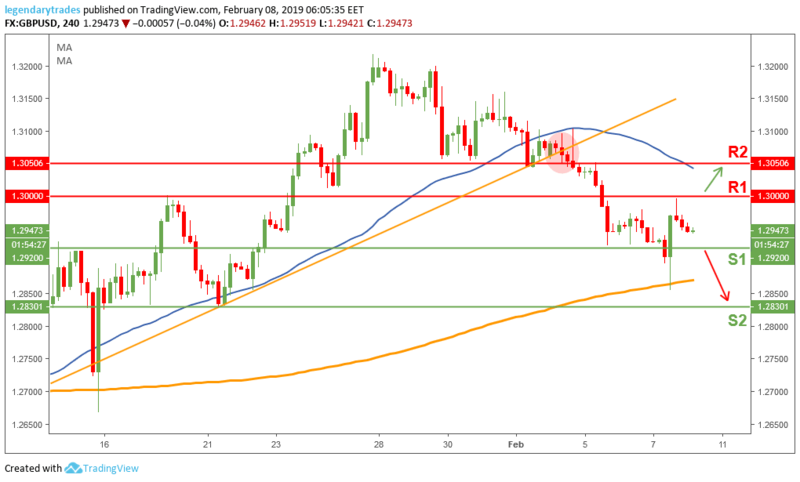 The Sterling had some wild swings in yesterday’s session by breaking below 1.2920 (S1) support, touching the 200-day moving average (1.2855) and bouncing all the way back up to 1.30. The bulls need to protect 1.2920 to keep this bullish momentum alive and the bears need to keep the price below 1.30 to stay in control. No clear bias at the moment on this pair, waiting for price action confirm the current market sentiment.